Should you wish to make further enquiries regarding any of these Imported Boxers, please click on the photo of the Boxer and details will be provided to the owners' web site, or email address. The owner and author of this site takes No Responsibilty nor endorses the use of any of these Boxers for Stud purposes or the purchase of puppies, or any of the Boxers description/information/photos supplied by Owners. The visitor should make all his or her own enquiries from the owner concerned. 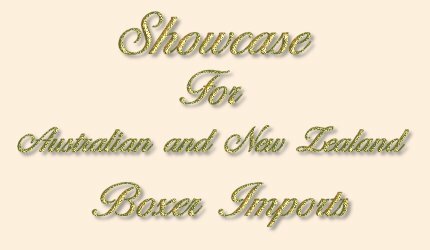 This site is simply to SHOWCASE the many Quality Imported Boxers to Australia and New Zealand. 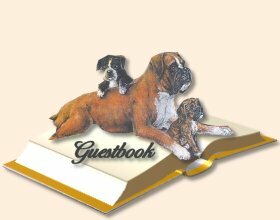 Any Australian or New Zealand Owner who feels they would like to feature their Imported Boxer on this Website, please submit Photo and Pedigree.